A clear, golden oil with a slightly nutty flavour, flaxseed oil is an excellent plant source of Omega 3, 6 and 9. Our flaxseed oil is sourced from New Zealand, certified organic and free of toxic residues. Brain function: Omega 3 is essential for cell membrane health, supporting mood, cognitive function, concentration and memory. Jess L. Reviewed by Jess L.
Quick delivery and excellent quality. Great on salad. I also liked the packaging and presentation. 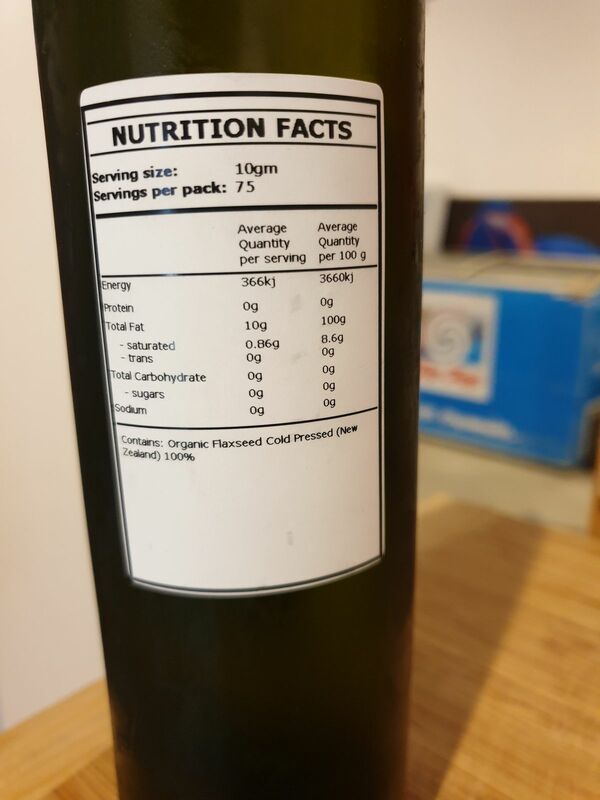 The nutritional information is up front on the label and not hidden away on the back like most food products. The oil comes in an attractive bottle that will be suitable for reuse when I've used up the flaxseed oil. Miriam B. Reviewed by Miriam B. An excellent product which tastes good especially on our morning porridge.